This Cerberuso Multitool with Pouch is a very handy tool for camping, hiking, hunting, survival, or just around the house. 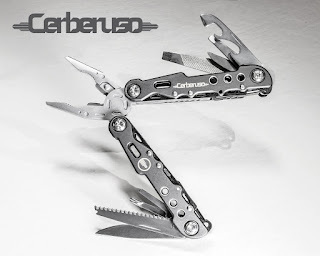 It has 14 diffrernt functions in the multitool pliers set. It feels very sturdy, unlike one of the others I bought in the past. I have only had them for a short time but have used them several times around the house. These work great for many different types of craft and DIY projects, and would also be perfect to take along for all sorts of outdoor activities. Right now I carry them in my car because you never know when you might need a tool and this way you always have them along. These would also work well in your bugout bag or survival kit.